Found on the far northern shores of Western Australia, Broome is one of the country’s most remote holiday destinations. This isolated town is over 2000 kilometres away from the state capital, Perth, and just as far from Darwin in the Northern Territory. This is the place to escape it all, to escape the crowds and to enjoy the fabled, laid back tropical airs of ‘Broome Time’. Things happen slowly this far north, but that’s just one of the reasons you’ll want to return time and time again to enjoy the delights and quirks of this colourful town and its serene surroundings. From the golden sands of Cable Beach to the unusual natural phenomenon that is ‘The Staircase to the Moon’, here are 9 reasons to visit Broome! Broome is one of the most chilled out towns in Western Australia because the lazy tropical climate and welcoming vibes make this is a special place to visit. Sure, it’s the largest tourist destination in the Kimberley region, but the population barely surpasses 10,000 people, making this a city break without the people, and up here in the north-west, life and holidays happen on Broome Time. It’s laid back, friendly and relaxing in a way that’s long since been lost in Australia’s larger metropolises. You can enjoy Broome Time however you want, by sitting back on the beaches, drinking cocktails in the sun, or doing absolutely nothing at all. Broome is famous for being the site of one of WA’s most unusual, yet spectacular, natural phenomena. 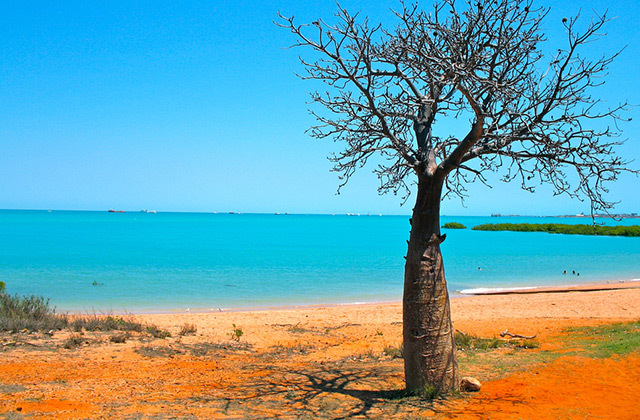 The Kimberley coastline and particularly Roebuck Bay, where the city itself is found, have one of the highest tidal differences in the world. Combined with huge mud flats extending out into the bay, and given clear skies and a full moon, you can experience the luminous sight of ‘The Staircase to the Moon’. Light from the moon is reflected gloriously across the mud flats, and across the ebbing tides as darkness falls, leading majestically towards land to create a wonderful staircase effect. It’s an event that happens several nights per month when conditions are perfect, usually between March and October - which also happens to be peak season in Broome. 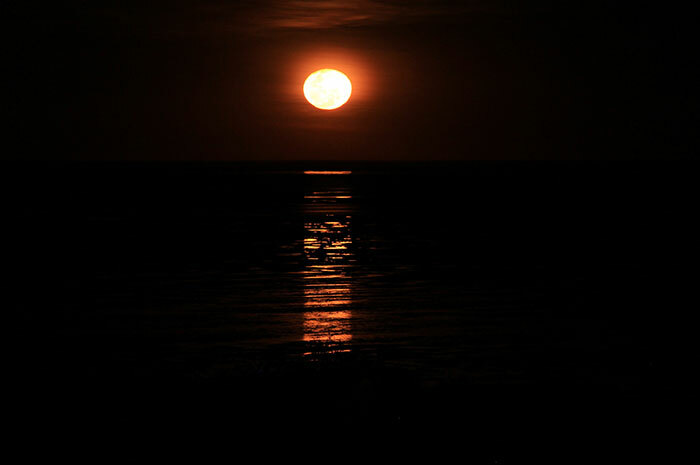 At Town Beach, looking out over the mud flats, you’ll find great views of The Staircase to the Moon, alongside packed local markets that are out in force for the event, while if you visit the nearby Mangrove Hotel, you’ll be treated to dreamy Aboriginal music while the moon rises over Roebuck Bay. Cable Beach is the pride and joy of Broome. This long stretch of sand runs for 22 kilometres along the coast, and is one of the most pristine beaches in Western Australia. Located just outside the town, the Cable Beach area is home to some of Broome’s best bars, restaurants and hotels, making this is a great place to stay, particularly if you want to really enjoy that laid back Broome Time lifestyle. With so much space, even at the busiest times of the year, you’ll find plenty of room for everyone on Cable Beach. You can rent a sunlounger, sit back in the sand or splash around in the surf. Wait until the sun sets, and you’ll experience a fiery display of tropical colours across the sky. Broome is the birthplace of some of Western Australia's most beloved craft beer, as the tropical weather produced the need for cooling drinks that were as refreshing as they were revitalising. Although the Matso’s brewery has outgrown its humble beginnings in the town to now be found and brewed across the state, you can still find the small microbrewery where it all began serving up some of the most original flavours in Australia. Matso’s signature beer is their deliciously invigorating alcoholic Ginger Beer, while they also serve up such tropical delights as Mango Beer, a fiery Chilli Beer known affectionately as the ‘Angry Ranga’, and more traditional white beers and stouts. Nowhere else in Western Australia can you enjoy such a full range of Matso’s beers, while they also serve up some great food to go with it. Broome is the unlikely location of the world’s oldest, continually functioning, outdoor cinema. Sun Pictures dates back to 1916 when they began to screen silent movies for the town’s growing population. Over 100 years on, and Sun Pictures is still going strong, showing all the latest releases alongside classic films in their leafy garden every night of the week. This is one of the most unusual cinema experiences you can have in the world, as Sun Pictures is found right under the landing path of the local airport, ensuring that the odd aeroplane will inevitably interrupt the screening at some point in the evening. The Courthouse Markets are held every weekend through the dry season - between late March and October - in the green grounds of the old Broome courthouse. 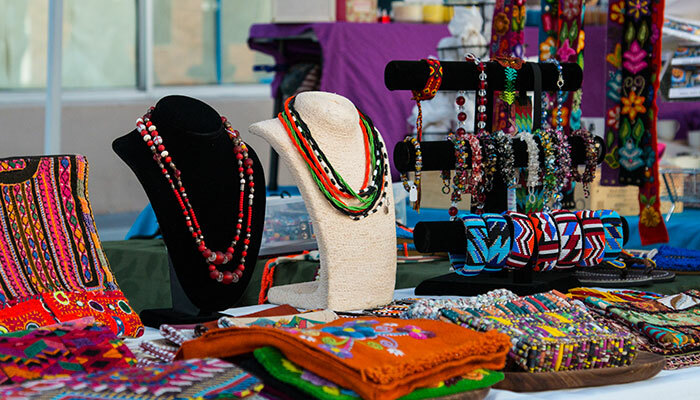 It’s the best place to spend a Saturday or Sunday morning, as you’ll be treated to an array of local stalls, businesses and food trucks selling their unique wares. There’s always a spot of live music and you’ll be able to soak in Broome’s distinctly multicultural atmosphere, with everything from classic Aussie pies to Filipino desserts being cooked up and prepared across the market. After spending just a few days in Broome you’ll have noticed the town’s vibrant diversity, and there are plenty of opportunities to delve into the local history to find out more. Before the arrival of Europeans, the Kimberley was home to local indigenous groups who still form a large portion of the population today. You can join local tours that take you along the coastline to explain the significance of the land to the locals through thousands of years or history. Modern Broome was built on pearling, and the town attracted not just Europeans but Asians too, looking to find their fortunes below the water. At the local history museum, you can find out more about the colonial era, while in Chinatown you can see the lasting influence of the settlers on Broome’s demographic and cultural makeup. At the Japanese Cemetery, you can see poignant evidence of the struggles faced by the early Asian pearlers who risked and in many cases lost, their lives in Broome while pearling. Long before the arrival of humans in Australia, Broome was home to species long since extinct. When the huge tides are far out to sea, then the red rock of Gantheaume Point on the edge of Cable Beach reveals its hidden secrets. 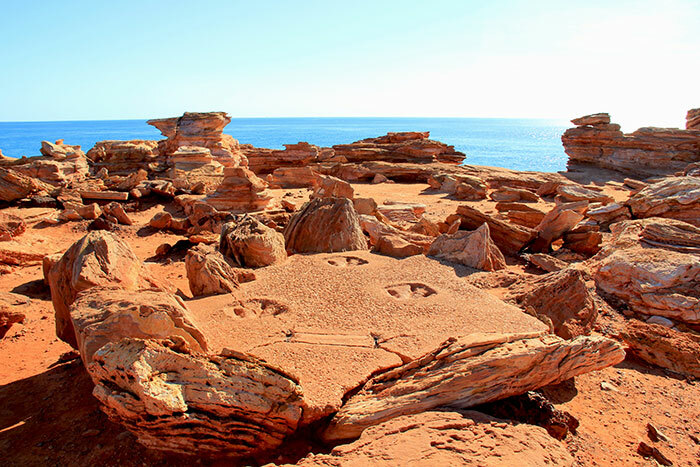 Fossilized in the red earth of the cliffs are ancient dinosaur footprints dating back hundreds of millions of years, from a time when the land here was part of a muddy, river system. Many of the footprints are found far out from the cliffs, but when the tide is low you can hike out across the rocks to find them. Be careful though, as the tides can change swiftly, so ask at the local tourist information of maps and tide timings, just to be safe. 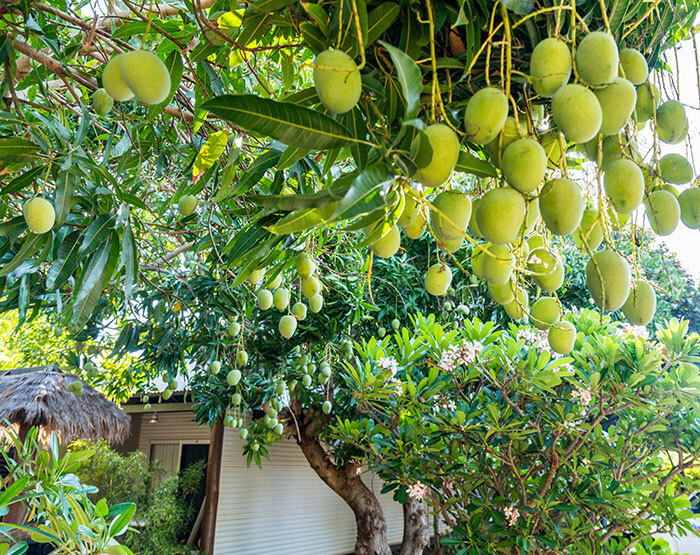 From mango flavoured beer to pizzas topped with mangoes, the tropical fruit is ubiquitous across Broome. In mango season you’ll find it everywhere, while even outside of mango season, you’ll find the locals prepared long ago and stuffed their freezers full when they could. Every menu you find in Broome will likely have some sort of mango twist, but head outside of town to The Mango Place for a true mango experience. Here you can find artisanal pizza - covered in mango - mango wines, spirits and cheesecakes, in a beautiful setting surrounded by, you guessed it, mango trees. 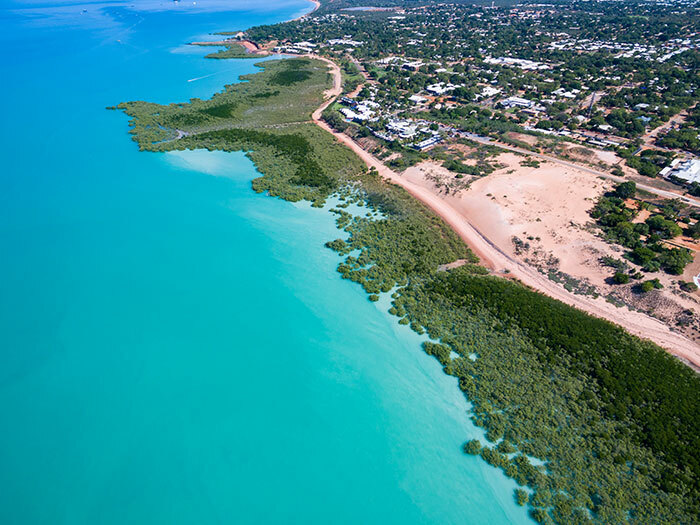 Book your trip to Broome: make an appointment with one of our Travel Experts or take a look at our Western Australia's Coral Coast itinerary. I'm Richard, The Travel Tramp, I'm an adventure traveller who can't stop getting off the beaten track. I write travel blogs with a dash of journalism and take photographs along the way!